The retrograde Donald Trump administration is planning a military coup in Venezuela to oust the socialist government of President Nicolas Maduro. U.S. Secretary of State Rex Tillerson, speaking at the University of Texas prior to embarking on a multi-nation tour throughout Latin America and the Caribbean, said the military in Latin America has often intervened in Latin American politics during times of serious crises. Tillerson’s remarks conjured up scenes from America’s dark past in Latin America. To make matters worse, Tillerson invoked the imperialistic Monroe Doctrine of 1823, stressing that it is as “relevant today as it was the day it was written.” The Monroe Doctrine, throughout American history, has been used by the United States to justify military interventions in Latin America, often with the aim of establishing “banana republics” subservient to Washington’s whims. According to a BBC report, Tillerson prefaced his augmented his remarks by stating that he was “not advocating regime change and that he had no intelligence on any planned action.” Richard Nixon’s National Security Adviser Henry Kissinger made similar remarks before the bloody September 11, 1973, Central Intelligence Agency-backed coup against Chile’s Socialist President Salvador Allende. While publicly rejecting any U.S. involvement in the destabilization of Chile’s democratically-elected government, Kissinger was working behind the scenes with Chile’s armed forces to overthrow and assassinate Allende. Eleven days after the Chilean coup, Kissinger was rewarded by Nixon by being named Secretary of State, along with keeping his National Security Adviser portfolio. Ever since Maduro’s predecessor, Hugo Chavez, came to power in 1999, the CIA has attempted at least one military coup — a putsch that was quickly reversed – in 2002, several “color revolution”-style street protests and disruptions, economic warfare, and CIA-initiated general strikes to force both Chavez and Maduro from power. Besides Mexico, Tillerson is also visiting Argentina, Peru, Colombia, and Jamaica. Tillerson’s stops belie his actual intentions. Argentina, governed by Mauricio Macri, a real estate developer crony of Trump, and Peru, whose scandal-ridden president Pedro Pablo Kuczynski has praised Trump, have led anti-Venezuela actions within the Organization of American States and other international institutions. Colombia has served as a base for CIA-backed paramilitary and intelligence operations against Venezuela. Due to U.S.-led sanctions against Venezuela, Colombia is now home to thousands of Venezuelan economic refugees, fertile ground from which to recruit foot soldiers in a coup against Maduro. All of Tillerson’s stops in Latin America – with the exception of Jamaica — are in countries that are members of the Lima Group, a bloc of nations seeking to peacefully ease Maduro from power in Venezuela. Tillerson’s stopover in Jamaica is obviously designed to pry away from Venezuela’s orbit, several Caribbean Community (CARICOM) island states that have benefitted from inexpensive oil deliveries from Venezuela. According to the BBC, Tillerson even joked in Texas about Maduro’s ultimate fate: “If the kitchen gets a little too hot for him [Maduro], I am sure that he’s got some friends over in Cuba that could give him a nice hacienda on the beach.” For Venezuelans who support their government, Tillerson’s “joke” was a reminder that Chavez, after temporarily being ousted in the April 2002 coup, was held captive at the Antonio Diaz Naval Air Station on the Venezuelan island of La Orchila. Had the coup not failed, it is believed the United States was going to fly Chavez into exile, possibly to Cuba via the U.S. Naval Station and detainee gulag in Guantanamo Bay, Cuba. Tillerson, who is apparently still carrying the water for Exxon-Mobil, is reprising the role played by Harold Geneen, the president of International Telephone and Telegraph (ITT). Geneen, working with the CIA, provided $1 million to Allende’s opponent in the 1970 presidential election, Jorge Alessandri. ITT was also discovered to have financially supported the 1973 coup plotters in Chile. In 1964, Geneen and ITT worked with the CIA to overthrow the democratically-elected Brazilian government of Joao Goulart. Today, it is Exxon-Mobil and its plant inside the Trump administration – Tillerson – who are working overtime to play the roles of ITT and Geneen in attempting to overthrow Maduro in Venezuela; imprison on trumped-up charges, Luiz Inácio Lula da Silva and Cristina Fernandez de Kirchner, the former and possible future presidents of Brazil and Argentina, respectively; and return U.S. “gunboat diplomacy” to the Western hemisphere. In a news conference in Mexico City, Mexican Foreign Minister Luis Videgaray rejected Tillerson’s notion of a military coup in Venezuela to oust the Maduro government. Present at the news conference was Canadian External Affair Minister Chrystia Freeland, an outspoken enemy of Venezuela and Russia. Tillerson has a visceral hatred for Venezuela that transcends Maduro and Chavez. In 1976, a year after Tillerson began working for Exxon, Venezuelan President Carlos Andres Perez nationalized Venezuela’s oil industry. Among the assets nationalized were Exxon’s holdings in the country. 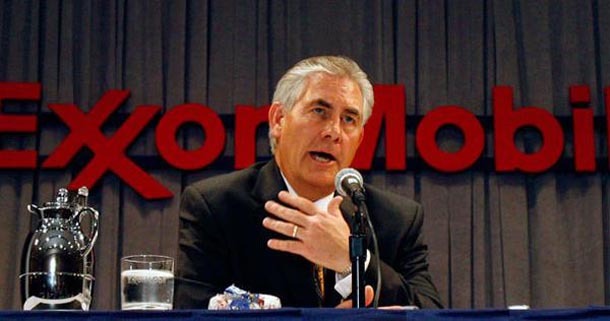 Chavez re-nationalized Exxon-Mobil’s assets in 2007, during Tillerson’s reign over the firm. Exxon-Mobil and Tillerson battled Venezuela over compensation by Caracas. Exxon-Mobil took its case to World Bank arbitration and demanded that Venezuela compensate the company with a $15 billion payment. The bank settled on compensation of only $1.6 billion, an act that ruffled Tillerson’s feathers. Tillerson never forgot that Venezuela won the skirmish over compensation for Exxon-Mobil. Tillerson now intends to even the score by seeking to overthrow Chavez’s successor, Maduro, from power. In 2015, Exxon-Mobil began oil operations off the coast of Guyana, to Venezuela’s east, in the disputed territory of Essequibo. Although Venezuela and Guyana have sought international arbitration in the case, that did not stop Tillerson, while heading Exxon-Mobil, to order his Guyana subsidiary, Esso Exploration and Production Guyana Ltd., to continue exploring in the disputed region. For Tillerson and his boss, Trump, legal agreements are apparently not worth the paper they are printed on. While in Jamaica, Tillerson is expected to lean on Prime Minister Andrew Holness to buy out Venezuela’s 49 percent stake in the Jamaican oil refining company, Petrojam. Tillerson wants to subject Caribbean nations, which established cooperative agreements with the Venezuelan oil industry through the PetroCaribe alliance, to cancel those deals to comply with Trump’s punishing Executive Order 13808, which extended “Russia-style” sanctions to Venezuela. Tillerson would like nothing more than to increase Exxon-Mobil’s profits by nixing PetroCaribe agreements with nations like Haiti, Nicaragua, Jamaica, Guyana, Belize, Honduras, Bahamas, Suriname, St. Kitts-Nevis, and St. Lucia, thus forcing Caribbean nations to purchase more expensive oil and gasoline from Exxon-Mobil. Tillerson has shown the ugly face of the Trump administration to Latin America. It not only wants to deport millions of undocumented Latin American residents of the United States in a mass movement of displaced persons not seen since World War II, but it wants to change, through bloody coups, governments not to Trump’s pleasing throughout Latin America.